The Alfa Romeo Giulia was unveiled in Milan last month, and has had people excited ever since. With a dramatic new take on design and striking performance to match, the new Alfa Romeo is a keenly anticipated model in the compact executive market. We Want Any Car take a look underneath and inside the 159 successor to see exactly what can be expected from the model, and how it matches up to German competitors like Audi and BMW. Having not released a model in the saloon market for four years, or even breached the compact executive market, the Alfa Romeo Giulia was always expected to be impressive. With a whole host of new features being implemented into the exterior design, users can expect to be surprised and impressed with the style overhaul. In an attempt to shift over to the compact executive market, the design has become more serious and sophisticated. Though the characteristic V-shaped grille remains, the adjoining air intakes and lip spoiler bring a new level of prominence to the front profile. Large LED units that stretch round the front and along to the wheel arches are favoured over the old intricate headlamp design, while the rims and visible brake pads on specific models add a touch of sportiness. Along with a boot spoiler and four glossy tailpipes, the rear is given the same treatment, making for a sporty yet refined model that promises to please. Matching the remarkable new design of the Alfa Romeo Giulia Quadrifoglio is its exceptional performance capabilities. With 50/50 weight distribution achieved by the use of lightweight aluminium and a 0-60mph speed of only 3.9 seconds, its plans of rivalling German giants like BMW and Audi’s M3 and A4 models respectively, looks set to be achieved. Auto and six-speed manual gearboxes will be available, as well as the choice of rear or four wheel drive, allowing users to fully customise the vehicle to their preferred driving style. 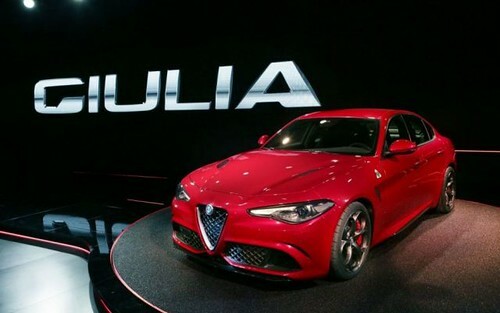 A 510hp turbocharged V6 engine, reminiscent of those present in Ferrari’s, will see the output from the new Alfa Romeo Giulia 2016 differ dramatically from previous models and current rivals on the market. Other confirmed models currently include 2.0L, 2.2L and 3.0L. The designers of the new Alfa Romeo Giulia 2016 have concentrated on offering technology both inside and outside the vehicle, allowing the driver to benefit from significant advantages all round. Torque vectoring technology delivers torque separately to each wheel for a near instantaneous response and stability on all surfaces, while the unique active aero front splitter is automatically lowered in high speeds to increase performance and handling. The model is also fitted with an electromechanical integrated brake system. The interior also benefits from technology designed to complement the users driving experience with simple but effective inclusions such as keyless ignition and a wide interactive display to allow for practical and easy use while driving. The New Alfa Romeo Giulia Quadrifoglio won’t be available until next year, but if the buzz already surrounding the innovative model is anything to go by, it looks set to become a popular and impressive model in the compact executive market.